Members of the Los Angeles Fire Department train at the Frank Hotchkin Memorial Training Center, at 1700 Stadium Way, just south of Dodger Stadium, next to the 110 Freeway. The building is named in honor of LAFD Firefighter Frank Hotchkin, who died while fighting a fire in 1980. It’s certainly not unusual for a fire department to name a facility after a fallen firefighter. But Hotchkin didn’t die battling a blaze in some distant part of the city. He died in the building that is named in his honor -- on property that was one of the city's first cemeteries -- long before it became the LAFD's training center. 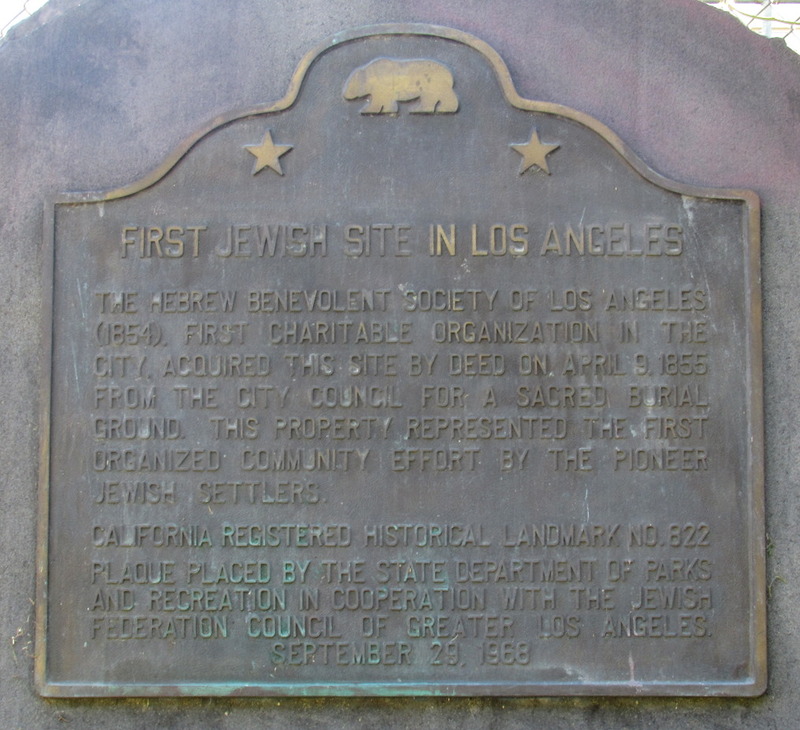 In April 1855, the newly formed Hebrew Benevolent Society of Los Angeles opened a cemetery on a three-acre site near the current intersection of Lilac Terrace and Lookout Drive, just south of the current location of Dodger Stadium and west of the 110 Freeway. The site, which was purchased from the city for $1, was officially known as the Hebrew Benevolent Society Burial Ground, but more commonly referred to as simply the Jewish Cemetery. The cemetery was located a few hundred yards west of the first Calvary Cemetery, the city's first Catholic cemetery, which opened 10 years earlier. By 1902, the Jewish Cemetery reached its capacity, and Congregation B'nai B'rith -- now known as the Wilshire Boulevard Temple -- opened the Home of Peace Cemetery on a 35-acre site at Whittier Boulevard and Eastern Avenue in East Los Angeles, and the remains buried in the original cemetery were moved there between 1902 and 1910, using horse-drawn wagons. A weathered and faded historical plaque marking the site of the old cemetery is located near the intersection of Lilac Terrace and Lookout Drive, about a quarter-mile west of Stadium Way. The plaque identifies the cemetery as "the first organized community effort by pioneer Jewish settlers." Part of the site of the old Jewish Cemetery was sold to the city of Los Angeles in 1905. The property was later used as a quarantine house for victims of smallpox, and as a trash dump. In December 1935, the L.A. City Council voted to donate about 4.5 acres of the Chavez Ravine property, including the former cemetery site, to the U.S. military, for use as an armory and training facility. The military thought the location -- in a deep gorge surrounded by hills and rugged terrain -- would be safe and protected from an enemy air attack. 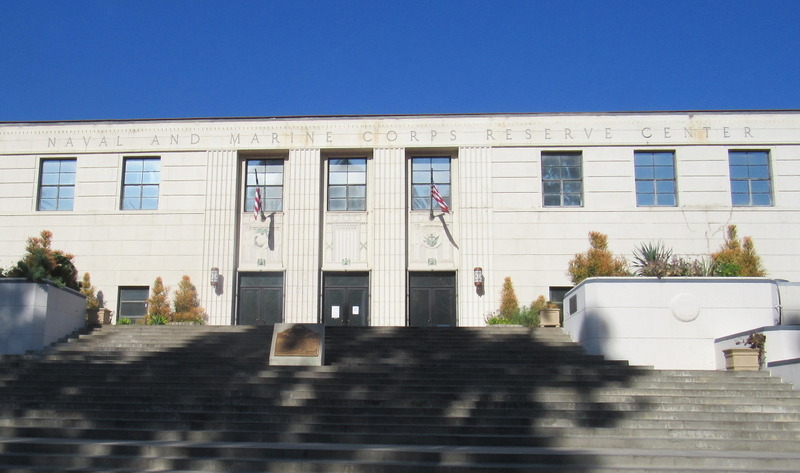 From 1938 to 1941, President Franklin D. Roosevelt's post-Depression Works Progress Administration (WPA), under the guidance of California architects Robert Clements and Associates, built the two-story, 90,000-square-foot Naval and Marine Corps Reserve Center, a reinforced concrete, Art Deco building which featured the largest enclosed structure without walls in the world. 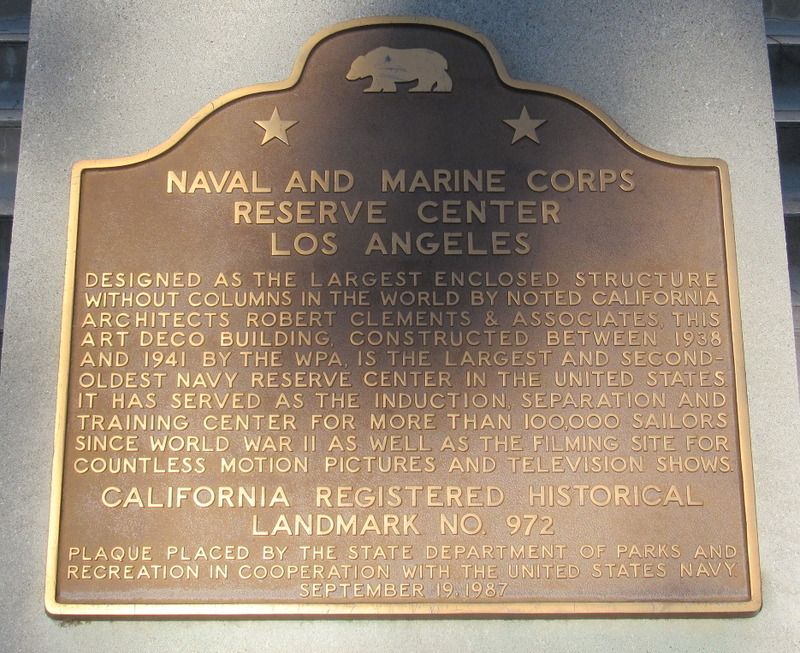 During World War II, the Reserve Center served as the induction and training center for more than 20,000 sailors, and a total of nearly 250,000 sailors and Marines passed through its doors throughout the building's history. From 1941 to 1945, the center served as a recruiting station, induction center, basic training facility and communications school. At about 9:30 a.m. on Saturday, Sept. 27, 1980, an electrical malfunction sparked a small fire in the attic of the center, not far from the main entrance. On a typical Saturday, the center is crowded with hundreds of reserve sailors and Marines participating in day-long drills and meetings. On this Saturday, however, nothing was scheduled and there was only a handful of staff members in the building. Shortly after the fire started, a maintenance worker noticed smoke coming from an air vent, but he assumed that the building's boilers were being tested. He noticed heavier smoke at about 10:30 a.m., but he didn’t call the fire department until 11:13 a.m., after he saw burning embers coming out of the air vents. In response to this type of a blaze, one of the first things firefighters typically do is cut a hole in the roof, to ventilate the building. This allows the heat, smoke and flames to escape out the top of the building, reducing the chances that the fire will spread, and also improving conditions inside the building, making the fire easier to fight. One of the dangers of sending firefighters onto the roof is if the fire has been burning long enough to weaken or damage the roof, making it likely to collapse. At the Reserve Center, the responding crews from the Los Angeles Fire Department didn't realize that the fire had been burning in the attic for almost two hours -- long enough to burn through 10 inches of wood sheeting underneath the tile shingles. About a dozen ax-carrying firefighters climbed up to the roof of the center, to chop a hole to ventilate the building. Firefighter Frank Hotchkin, 24, a 3½-year veteran of the department, was on the roof when he realized he would need a pike pole to punch a hole in the roof. He returned to the roof with the pole and was walking across the roof when it collapsed. Hotchkin fell through and was killed. Four other firefighters received minor injuries while battling the blaze. Hotckin was born July 17, 1956, in Los Angeles, the second child of Howard and Barbara Tlacil Hotchkin. His older sister, Phyllis, was born on June 12, 1953. Hotchkin's family ancestry in the United States can be traced back 10 generations, to the mid-1600s, when John Hodgkin arrived in Connecticut from England. 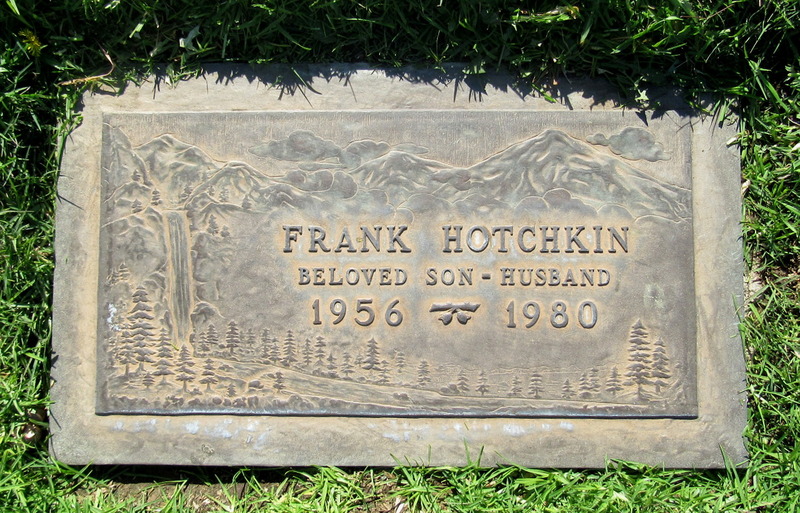 Hotchkin grew up in Van Nuys, and graduated from Ulysses S. Grant High School in 1974. He attended Los Angeles Valley College in Van Nuys before he joined the Los Angeles Fire Department on May 15, 1977, after spending two months at the L.A. City Fire Department Training Academy. Less than a year later, on Feb. 4, 1978, Hotchkin married his high school sweetheart, June Marie Bergstrom, and the couple lived in Newbury Park. Hotchkin served his probationary period at Fire Station 39 in Van Nuys and Fire Station 83 in Encino, and finished his training at Fire Station 88 in Sherman Oaks, where he spent more than two years. 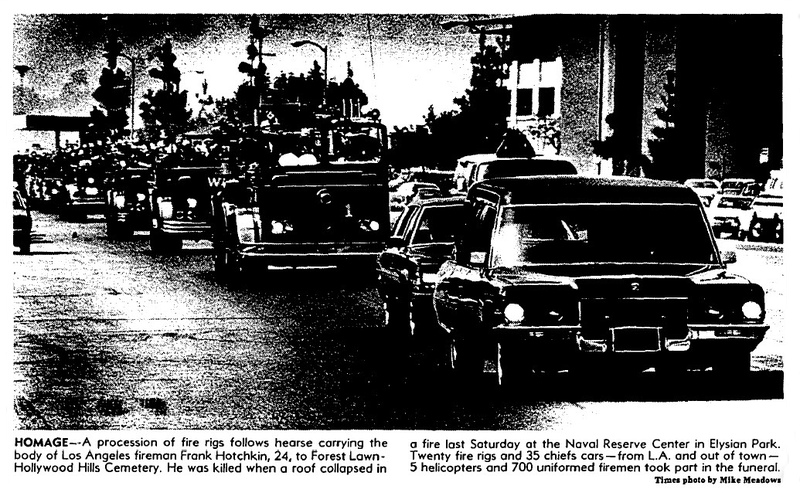 He then spent a month at Fire Station 12 on North Figueroa Street in Los Angeles before he transferred to Fire Station 1 on Pasadena Avenue, just east of the Golden State Freeway, and about two miles from the Naval and Marine Corps Reserve Center in Chavez Ravine. "Frank's death is far more than a tragedy," said LAFD Capt. Russ Wenk, who was Hotchkin's supervisor at Fire Station 88. "He was one of those rare individuals who could do any job, any time. He just cared so much about people. That’s what his death was about -- he always wanted to do that little bit extra." An estimated 160 firefighters spent more than two hours putting out the fire at the Reserve Center, and the damage was estimated at $500,000. Living quarters for visiting admirals, a banquet hall and bar, an indoor pool and a rifle range were destroyed. 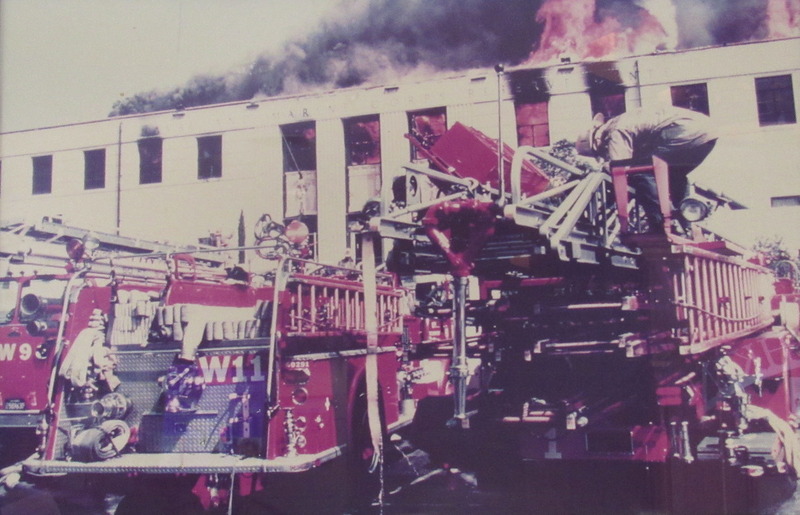 The fire also destroyed four decades of documents, and forced about 500 reservists to train in cramped trailers. Hotchkin's funeral service was held at St. David's Episcopal Church in North Hollywood, with burial at Forest Lawn Memorial-Park in Hollywood Hills. More than 700 uniformed firefighters from Los Angeles and surrounding communities attended the service and joined the miles-long procession to the cemetery, which was led by 20 fire rigs and 35 chief cars, behind the hearse carrying Hotchkin's body. At the cemetery, a Marine Corps Honor Guard fired a 21-gun salute, while city police and fire department helicopters flew overhead. Firefighters from the stations where Hotchkin worked served as his pallbearers. After six years and $4.5 million in renovations, the Reserve Center reopened, and was formally rededicated in August 1986. The building was also designated as a California Historical Landmark. 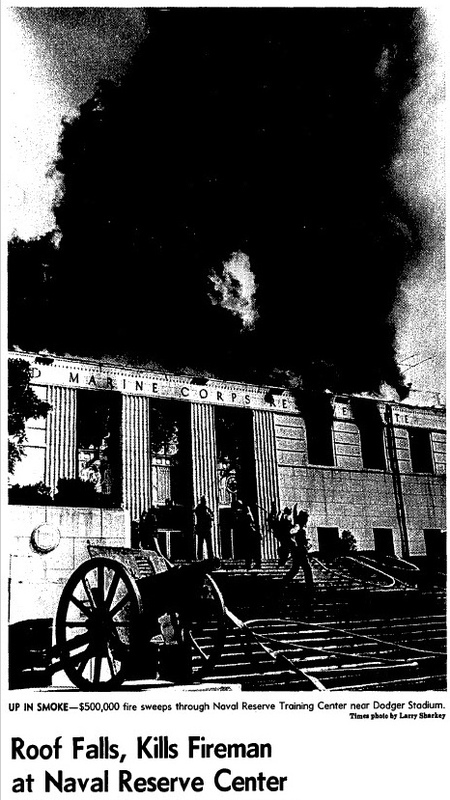 Later, the building was leased to the LAFD for use as a training facility, and was formally named the Frank Hotchkin Memorial Training Center.